In the spring of 1890 a few of the resident baptists of Dewy Rose, realizing the need of a church, withdrew their membership from Deep Creek Baptist Church and Antioch Baptist Church. These residents met in the local school and established the Dewy Rose Baptist Church. The presbytery was composed of: Rev. L. W. Stevens, Chairman; Rev. J. W. Vickery; Brother W. C. Christian; Rev. G. J. Christian; Mr. And Mrs. John T. Christian; Mr. And Mrs. W. C. Christian; Mr. And Mrs. Jacob Vaughan; Mr. And Mrs. W. A. Brown; Mr. James W. Moore; Mrs. Alex Hall; Mr. And Mrs. John Burden; Mr. E. N. Kinnerbrew; Mr. And Mrs. Riley Crook; and Mr. J. H. Nelms. Rev. L. W. Stevens was the first pastor of Dewy Rose Baptist Church. Worship services were held in the school until October 1890 when the new House of Worship was completed. The cost of the building was $750.00 and Mr. Ben Willis donated the land on which it was constructed. The first building was a one room wooden structure with two doors on the front and windows down each side. The funeral services of Mr. John T. Christian, held in early November 1890, was one of the first services. His remains were the first to be interred in the church cemetery. In August 1919 it was decided that the congregation had outgrown the current building and a new House of Worship was needed. Under the pastorate of Rev. A. W. Bussey it was decided to raise $5,000 for the construction of a new House of the Lord. By January 1920 this amount had been raised. Before construction began, the building committee suggested that an additional $5,000 be raised by taking pledges for a five year payment for the construction of the building with a brick veneer. This money was soon pledged and construction began in June 1920. The final cost was about $12,000. The first services were held in the new sanctuary the third Sunday in February 1921. The church was dedicated December 2, 1928. During the dedication services the church history was read. The two greatest accomplishments of Dewy Rose Baptist Church during this time was the pledge to support the Georgia Baptist Convention’s mission programs and the organization of the local chapter of Women’s Missionary Society. Also, during this period the church had organized its Baptist Young People’s Union and the Sunday School Program. In 1937 a movement was started by the WMS to purchase new pews for the church. The amount of $811.67 was collected and the pews were purchased in 1938. A plaque was placed on each pew showing the donor’s name. In 1945 the church decided to expand its worship services from monthly to bimonthly services. Rev. J. B. McLane was our first pastor for bimonthly services. During this time it was decided that there was a need to have a pastor to live in the community. The church voted to build a pastorium in order to meet this need. W. C. ALLEN and L. G. Brown donated the land in 1946. 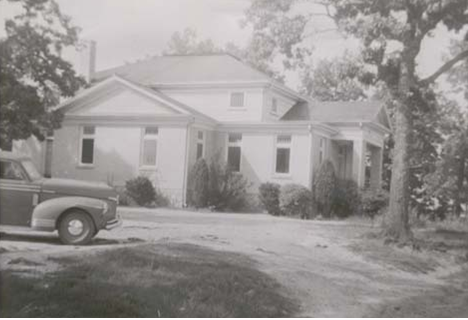 The pastorium was completed in 1948, and the Rev. W. W. Crawford was the first pastor to live in the pastorium. A new room was added in 1954. In 1957, twelve new pews were purchased for the classrooms and the floors in the sanctuary were refinished. In 1958-1959 the church added new pulpit furniture. The Communion Table was donated in the memory of Mr. and Mrs. Tilden Oglesby by their children. In 1960-1961 four classrooms, two restrooms and an assembly room was added. These were dedicated on August 4, 1963 with Rev. J. B. McLane in charge of the services. In 1963 a new outside sign, displaying church services, was erected. In 1968 carpet was installed in the church sanctuary, the church was painted and new windows installed. On February 27, 1972, Rev. J. V. Chambers began as the first full time pastor to our church. In September 1972 a baptistery was built and new drapes were installed. In 1974 central heating and air conditioning was installed. In 1975 a kitchen was added to the church annex. In 1980 the church purchased an additional six acres of land adjoining the church property. In 1984-1985 the church grounds were landscaped and a paved walkway built. In 1986 paved parking areas were added. In 1987 aluminum siding was installed on the exterior walls. New carpet was installed in the church sanctuary. In 1988 the ceiling was lowered and new lighting fixtures were installed in the fellowship hall and two hallways. In 1988-1989 the pastorium was remolded and included the installation of central heating and air conditioning. In August 1989 the Rev. J. V. Chambers retired as pastor after more than 17 years of service. In September of 1989 the church unanimously called Rev. Gary D. Purvis as our new pastor. On September 2, 1990, the church celebrated its 100 th year of service to the Lord. Rev. Gary D. Purvis was in charge of the service with Rev. J. V. Chambers participating. A “Centennial Homecoming” was held with dinner on the grounds after the services. Photographs were made for the church’s first pictorial directory. In 1990 a handicapped ramp was added to the back of the church and a church van was purchased. On August 26, 1990 the church voted to build a 56,700 square foot multipurpose building consisting of a kitchen area, dining area, classrooms and recreational area. On May 4, 1991 the first services were held in the new building and the note burning celebration was held April 26, 1992. Also, in 1992 the church’s parking areas were expanded and paved and a major renovation and expansion of the pastorium was completed. In 1993 renovation continued around the church with paved walkways and breezeways be added; Dewy Rose Baptist Church, helped sponsor one of our members, Marc Albertson, to go on a mission trip to the Ukraine. Marc was the first member to go on a foreign mission field since Mrs. Evelyn Hulme Horton in the 1950s. In 1994-1995 the church renovated the sanctuary by having the pews refinished, installed a new sound system, purchased a new Clavinova, a computer and established a fenced-in playground. In 1995, with a renewed emphasis on missions, Dewy Rose Baptist sponsored Pastor Gary Purvis, Jason Machen, Jeff & Sandy Adams, Tami Finch, Virgil Suttles and Tom Pierce for a four week mission trip to India. During the summer our youth mission team went to Kentucky to conduct Vacation Bible School. During 1996 William Vaughn was ordained into the ministry and became the pastor of Van’s Creek Baptist Church. The Youth Mission Team again made a mission trip to Kentucky under the supervision of Michael Stovall, Youth Director. In September Curtis and Andrea Shepherd was appointed as youth directors. The church purchased a new van and a second computer. In 1997 the church voted to buy an acre of land in India for use by Good News for India and sponsored Pastor Gary Purvis to participate in the dedication services of the new library at L. W. New Bible College in India. The deacons approved to start paying the youth director as a part-time or bi-vocational position. Improvements to the church’s facilities included installing new light fixtures in the sanctuary, installed new carpet in the classrooms, enlarged the nursery and purchased new hymnals. During 1998, in an effort to reduce over crowded condition in the sanctuary, we started conducting two morning worship services, one at 9:00 AM and one at 11:00 AM. The youth mission trip again was to Kentucky to conduct Vacation Bible School. In 1999, again, missions were the emphasis of our service. The following 14 members went on an international mission trip to Ukraine: Pastor Gary Purvis, Barry & Nancy Lunsford, Chris & Michelle Clark, Charla Webb, Floyd & Annette Dye, Curtis Shepherd, Stacy Drake, Henry & Jolynda Burdette, Charles Willis and William Vaughn. Also, in 1999 Courtney Purvis went on an international mission trip to Germany. Our youth mission trip included 16 members going to Buffalo NY under the leadership of Curtis Shepherd. Clowns for Christ, a joint mission endeavor with Bethel E Baptist Church in Elberton, included 5 members of Dewy Rose Baptist Church going to Panama City, Florida. A part time administrative assistant was hired. The congregation voted to donate a van to the Hispanic Mission of First Baptist Church in Elberton. Improvements to our facilities included installing a new baptistery and choir area. In June it was decided to dispense with the two morning worship services and Sunday morning service times were changed to Sunday School at 9:00 AM and Morning Worship at 10:00. During 2000 the congregation voted to build a new Worship Center. The estimated cost is $280,000 - $300,000. The building committee is Dayton Kurtz, Chairman; Charles Willis, Barry Lunsford, Margaret Purvis, Deborah Holbert, Greg Hall and Byron Butler. Finance Chairman is Jeff Adams. On May 21, 2000 the “Ground Breaking Celebration” was held after a very emotional and Spirit filled worship service. On August 5 th, 2001 the new Worship Center was dedicated to our Lord and Savior and for His service. The building is 60 x 120 feet and consists of three classrooms, a media room, a crying room, a large nursery, 4 restrooms, and a large sanctuary that would seat up to 400 people. Stained glass windows were donated and a new paved parking area was added. The total cost for the building and parking lot was approximately $300,000.00. In December 2001, Kennith R. Martin, Jr. was selected to serve as full time Associate Pastor for Student Ministries.